Steve Earle's Hero, Heckler: Townes Van Zandt Van Zandt's songs of loners, lovers and misfits made a deep impression on Earle, so much so that he's made a new album of covers. Earle tells Melissa Block about Townes, a tribute to his friend and musical mentor. 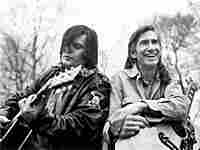 A younger Steve Earle (left) with Townes Van Zandt. In the 1970s, the name Townes Van Zandt had a magical pull in Houston. The man with the long, thin face and well-worn voice wrote stories of loners, lovers and misfits in song. Van Zandt died of a heart attack in 1997 at 52. Years of alcoholism took a toll on him. But he inspired a generation of younger songwriters. And no doubt his most devoted protege was Steve Earle, who became a lifelong friend. Earle remembers crashing a birthday party for singer Jerry Jeff Walker in 1972 when he was 17 — and falling under the Townes Van Zandt spell. "About 2:30 in the morning, Townes walked in," Earle says. "It was the first time I'd ever been in an environment with him where we weren't separated by a microphone. And he had on this beautiful buckskin jacket. And Townes started a craps game and lost every dime that he had. And that jacket. Within 15 minutes. And I thought, 'My hero.' "
Earle says he didn't actually meet Van Zandt that night, but he certainly did less than a month later. Earle was playing a small club in Houston, and Van Zandt was in the front row — heckling. "Finally, I played this song called 'Mr. Mudd and Mr. Gold' that Townes wrote, which has about a ber-zillion words," Earle says. "And he shut up." Steve Earle has just released Townes, a new album of Townes Van Zandt covers. In an interview with Melissa Block, Earle recalls telling Van Zandt about the birth of his oldest son, Justin Townes Earle. "Yeah, I remember when Justin was born, I called Townes, and I said, 'Well, it's a boy, and his name's Justin Townes,' " Earle says. "He goes, 'Is that after anybody in my family?' 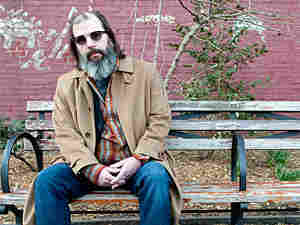 "
Click the link at the top of the page to hear Melissa Block's full interview with Steve Earle.